The bronze plaque set in small garden plot lined with bluestone blocks commemorates James Harrison who opened the first iceworks in Australia near this site. 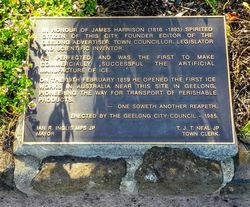 Pioneer editor of the Geelong Advertiser newspaper from 1840 to 1864, James Harrison worked as a journalist on various newspapers in Victoria from his arrival there in 1839 until his return to England about 1873. He was also a keen inventor, being a pioneer in all kinds of refrigeration and in 1873 he won a gold medal at the Melbourne Exhibition by proving that meat kept frozen for months remained perfectly edible. 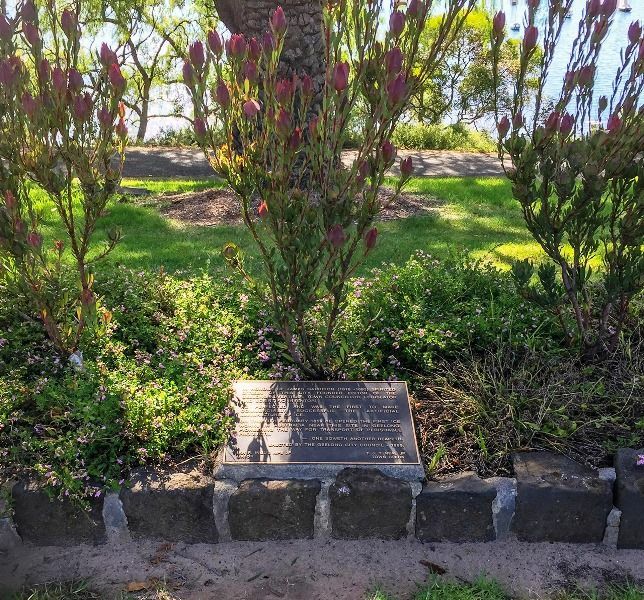 In honour of James Harrison (1816-1890) spirited citizen of this city, founder editor of the Geelong Advertiser, town councillor, legislator and scientific inventor. He perfected and was the first to make commercially successful the artificial manufacture of ice. On 19th February 1859 he opened the first ice works in Australia near this site in Geelong, pioneering the way for transport of perishable products. T. J. T. Neal JP Town Clerk.